Le Journal des Dames et des Modes, Frankfurt edition. January 1, 1803. The German edition of this French publication was still written in French, with most of the text being an exact copy. I suppose French was the language of fashion, as this was a magazine about fashion. 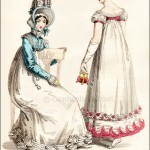 Prints from the German edition almost always took plates from the original French edition and modified them, generally by joining figures from two separate plates into one, as here, where we have an evening dress and a walking dress. Each of these figures was published in individual prints the previous year in the Paris publication. I’m not sure why so many of the German prints say, in translation, Fashions of the French and English at the top, as all the prints come from Paris. The Germans did not have the engraved plate used by the Paris publication, nor did they slavishly copy the Paris prints. They are always completely redrawn and, I have to admit, often drawn better. 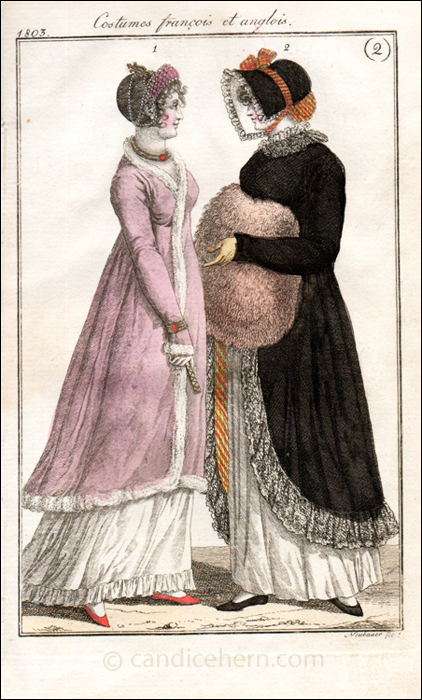 The walking dress in this print includes a fabulous fur muff, my favorite Regency accessory, as well as a brightly striped lining to the dark pelisse. The same striped fabric is featured on the bonnet. 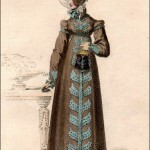 The evening costume includes an overdress or robe that appears to be trimmed in white fur or swansdown. Note how the bracelet is worn on top of the sleeve, which is typical for this era. The hairdo includes a complicated arrangement of pearls and a cunning little gold trident.